Aug. 4, 2017 | 3:10 p.m.
Late blight can be devastating to tomato growers. As gardeners around Wisconsin eagerly anticipate the tomato harvest, the state's first confirmed report of late blight in 2017 is bringing disappointment to some growers in Waukesha County. 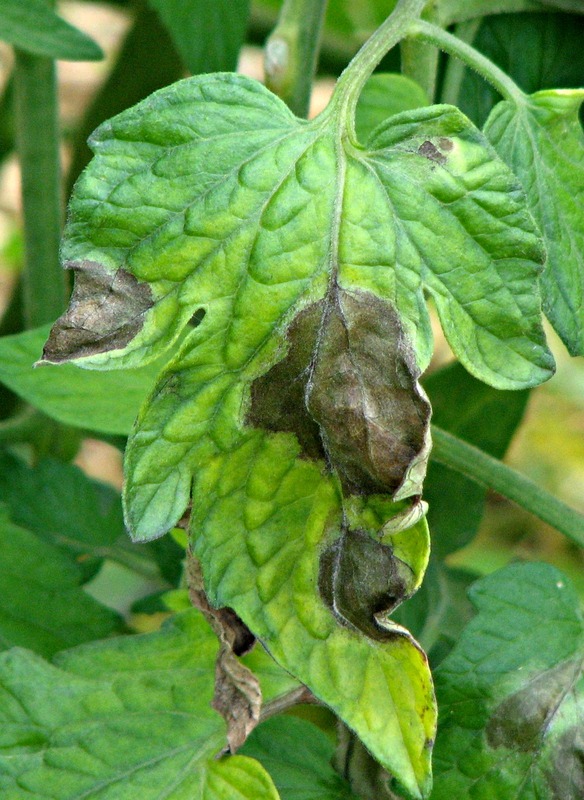 A highly destructive fungal disease caused by the mold Phytophthora infestans, late blight can wipe out an entire tomato or potato crop in a short period of time. The fungal spores of late blight can spread quickly by wind, and once infected, plants can show symptoms within one week. It is one of the few plant diseases that are difficult to control, and it can cause severe economic loss to growers. Persistent wet weather over the first half of 2017 has created ideal conditions for late blight disease to spread more quickly than is typical. In Brown County, late blight is no stranger, with multiple reports from gardeners and growers in previous years. Home gardeners are strongly encouraged to scout their tomato and potato plants every day and immediately take preventive measures against late blight. What should growers look for on tomatoes and potatoes to see if their plants have been infected? An initial indicator of infection is any sign of pale green or olive green patches along the margins or at the tips of leaves. These infected patches can quickly enlarge and become a water-soaked lesion that is brown-black in color. During early morning hours, the underside of leaves develop a white-grayish fuzzy growth. Infected plant stems develop dark brown to black lesions. Infected tomato fruits have sunken spots with golden to chocolate brown lesion that have a distinct ring around them. Potato tubers develop a dark brown to purple discoloration. What treatments can gardeners use to manage late blight? Fungicides should be applied prior to infection. If this is not done, the treatment won't be effective in preventing the disease. Fungicides containing copper or chlorothalonil as the active ingredient can be used as a preventive application. The fungicide should be applied once every five to seven days. However under excessively wet conditions, fungicides can be ineffective. Organic copper fungicide products include Copper Fungicide, Copper Soap, Dragon Dust, Earth Tone and Garden Dust. Chlorothalonil fungicide products include Daconil, Fung-onil and Ortho Max Disease Control. Product labels should always be read closely to follow their directions for safety and appropriate rate of application. Late blight among tomatoes can be identified by several indicators, including discolored lesions on leaves. For proper identification of the disease, gardeners can send a plant sample to the University of Wisconsin Plant Disease Diagnostic Clinic for testing. The sample should be placed in a sealable plastic bag with no wet packaging material. Additionally, growers can email a photo of infected foliage to local UW-Extension offices. It is critical to identify late blight at an early stage to minimize the spread of this destructive plant disease. More information about late blight is available from a UW Plant Disease Diagnostic Clinic fact sheet, a UW-Extension Learning Store publication on the disease in tomatoes, and through USAblight, which is a national project of the U.S. Department of Agriculture.